Bride of Frankenstein (advertised as The Bride of Frankenstein) is a 1935 American horror film, the first sequel to the influential Frankenstein (1931). 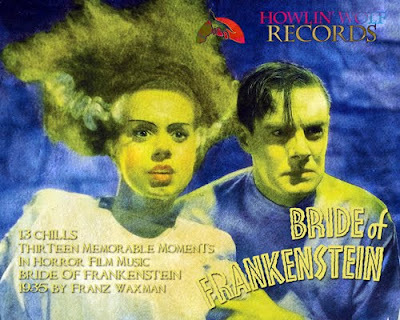 Bride of Frankenstein was directed by James Whale and stars Boris Karloff as The Monster, Elsa Lanchester in the dual role of his mate and Mary Shelley, Colin Clive as Henry Frankenstein and Ernest Thesiger as Doctor Septimus Pretorius. The film follows on immediately from the events of the first film, and is rooted in a subplot of the original novel, Frankenstein (1818). In the film, a chastened Henry Frankenstein abandons his plans to create life, only to be tempted and finally coerced by the Monster, encouraged by Henry's old mentor Dr. Pretorius, into constructing a mate for him. Preparation began shortly after the first film premiered, but script problems delayed the project. Principal photography started in January 1935, with creative personnel from the original returning in front of and behind the camera. Bride of Frankenstein was released to critical and popular acclaim, although it encountered difficulties with some state and national censorship boards. Since its release the film's reputation has grown, and it is hailed as Whale's masterpiece. On several occasions, Universal Pictures has sought to remake the film.